As development pressures build, Metro Area communities look to redevelop land adjacent to natural amenities. The challenge, however, are the historic land uses on these parcels. Businesses such as auto salvage yards, recycling centers, or lumber yards, bring up questions about the environmental suitability for redevelopment. What types of partnerships, financing, and resources make clean-up ad re-use of the this land a viable option? The most recent retail district at River Point in Sheridan, CO is an exciting urban renewal project consisting of major retail stores, specialty shops, dining, and entertainment. It was built on land that was formerly a landfill. 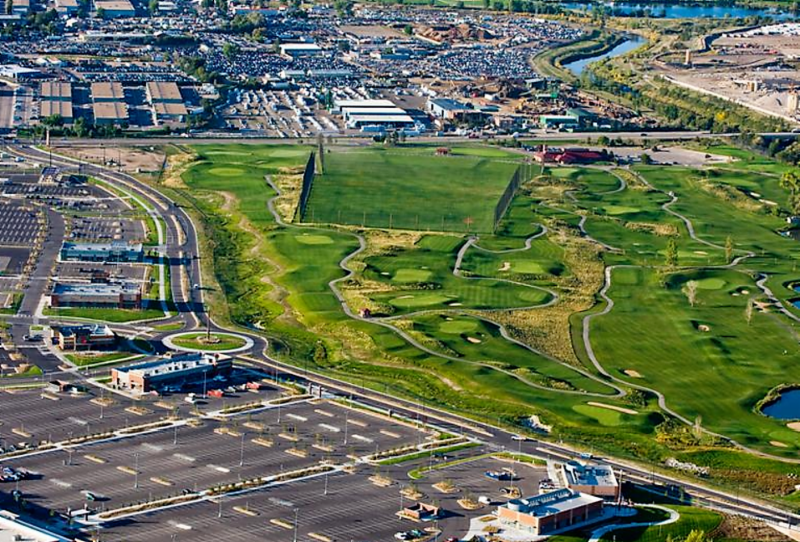 A public improvement fee (PIF) of 1% was established to pay for the public improvements at River Point. Improvements included: Environmental remediation, open space and trails, public roads and bridges, public street lighting, regional stormwater, water quality and protection, and utility infrastructure. We talked to Jennifer Henninger, a senior city planner who works with the City of Sheridan, about the urban development in the area. DCI: What challenges has the community faced? What is an example of a successful project? JH: The area immediately to the north of the Sheridan Santa Fe Business Park (SSBP) used to be a series of landfills, older businesses, and in general, an unsightly mess. Through an urban renewal process the area has been redeveloped into the successful River Point Shopping Center. What outreach and response have you seen from property owners in the area? Several property owners in the SSBP area are interested in having water and sewer connections to their properties so they can either expand their operations or make their land more valuable to future developers. There are two large property owners in the are that have their properties up for sale. Are there currently incentives or design guidelines to shape investment for developers and property owners? There are no incentives or design guidelines in place to shape any type of future development. All of the property in the SSBP is zoned industrial. Be IN THE GAME. Join DCI at the Vibrant Downtowns: IN THE GAME Conference on May 2-5 in Breckenridge Colorado as we explore solve this challenge and 10 others that Colorado Communities are facing. IN THE GAME Challenge Studios are designed to transform a community's difficult challenges into promising opportunities. Participants will work side-by-side with leading industry experts and local peer networks to craft problem-solving plans. In the process, the participating communities will be be connected into supporting resources and networks; helping them to get job done. Register here! In a small town such as Nederland, CO it isn't uncommon that one person may own a lot of the commercial property. Property owners with huge stakes in a small town highlight the importance of clear processes and incentives that help the private owner understand and comply with the community vision. What incentives are can help a town wary of density and in need of sustainable building when a developer with big plans owns 20% of the downtown? DCI talked with Katrina Harms, chairperson for the Nederland Downtown Development Authority (NDDA) , about the challenges that Nederland faces with promoting the right grow for its community. As Nederland contemplates increased development, what components of the community vision you are hoping could be promoted by new development? The NDDA embraces the ideals from the town's comprehensive plan, which states: "We recognize that minimizing our impact, both in the resources we consume and the waste we produce, is important if we are to maintain the lifestyles that drew us to Nederland. The Town of Nederland has a commitment to quality of life, sustainability and preservation of small town character." As the Nederland Downtown Development Authority (NDDA) works to enhance business opportunities in the downtown area, it keeps preservation and restoration of the environment at the heart of the organization's development philosophy. Are there recent projects that have been viewed as successful? In 2009 a sidewalk was added to create a safe, walkable connection from the north end of downtown to the south end of downtown. In 2016 a path was built to connect the west end of town -- the Regional Transportation District (RTD) station and Library -- to the east end of town -- the Post office and Barker Reservoir. Two spurs reach to the highway at bus stops and two bus shelters were built. In 2014 the NDDA established a beautification program that included: native flowers in the summer and holiday decorations for downtown businesses to promote a festive atmosphere in the winter. Are there other stakeholders or partners that could be more involved in finding solutions? The NDDA is attempting to get representation from the Planning Commission, Sustainable Advisory Board, and the Parks and Recreation Advisory Board. On March 29th, 2017, Downtown Colorado, Inc. (DCI) launched their Business Enhancement Survey program in Leadville, CO. 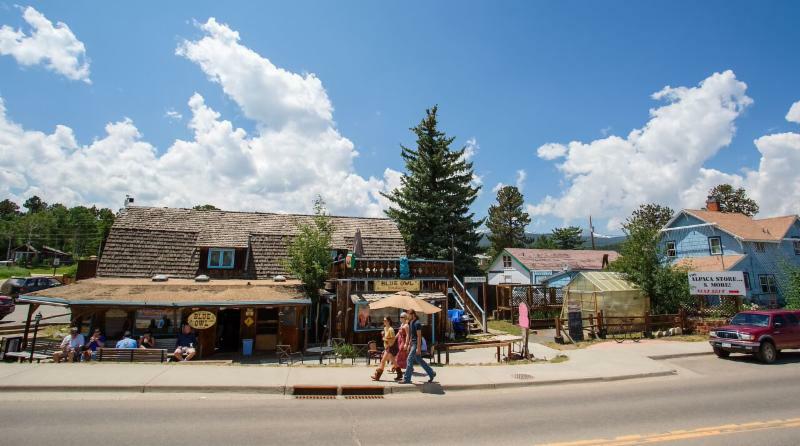 Businesses in Leadville were given the opportunity to complete a survey online describing their current conditions, goals, and perceived problems. From this pool of businesses in Leadville, Alpine Furniture was selected for an in-depth audit on ways they could improve their businesses. 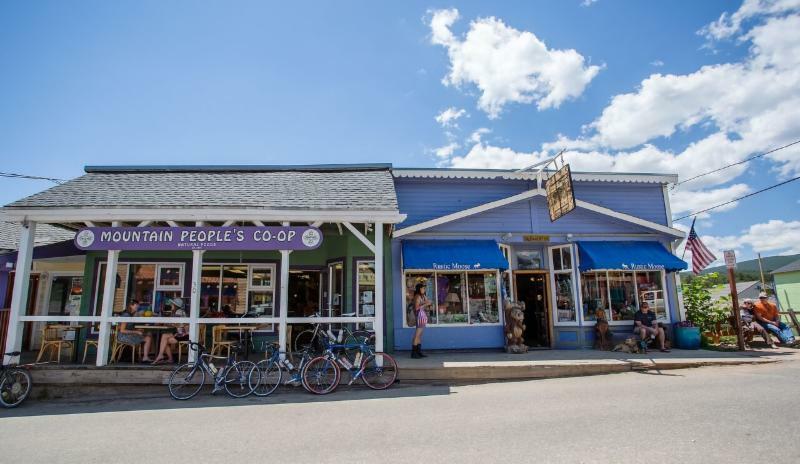 All other businesses in Leadville (including the ones that completed the survey, but were not selected for the audit) were invited to a lecture series on ways they could improve their businesses in terms of retail management, design, and personal conviction. DCI traveled with a team of consultants, including Alyson MacMullen, Brian Corrigan, and Katherine Correll. One of the team, Heather Garbo, was not able to make it to Leadville, but nevertheless, supported the team's efforts. On Wednesday afternoon, we acted as secret shoppers at the businesses who completed the survey. This was a challenge, as there were four of us, and many of these businesses were small enough that it would be unlikely that four, unrelated people would enter them on a Wednesday afternoon in Leadville's off-season. To avoid being suspicious, we entered each business at different times. After we visited the businesses, we held a planning session at La Resistance, a local coffee shop in Leadville, and set to work on the presentations. At 5:30pm we headed over to People's Bank in Leadville, where we would give the presentation to the businesses. The winner of the audit, Alpine Furniture, was announced, and the team headed over to the store to do an initial evaluation of the company. The business enhancement survey could be a powerful tool to help local businesses and economies, if it is executed correctly. Businesses are, after all, the engines which can propel or inhibit a society's development and health. By targeting businesses and business people directly, DCI may be able to reach some of the core problems which prevent a society's ability to thrive and be well in their ecological, and social environment. Stay tuned for updates on our Business Enhancement Program. Feel free to contact DCI at outreach@downtowncoloradoinc.org if you would like to know more this program. On February 6th, 2017, Downtown Colorado, Inc. (DCI) facilitated a dialogue that focused on housing resources and stakeholders in Grand County. The event was hosted by the Town of Fraser, with support from the Grand Foundation, who provided lunch for the participants. This was the first in a series of rural housing workshops that DCI plans on leading across Colorado throughout 2017. Participants and stakeholders included Katherine Correll, Downtown Colorado, Inc. (DCI) and DiAnn Butler, Grand County Economic Development, involved state agencies, private sector partners, and other communities working on housing, including Terry Barnard, Colorado Housing and Finance Authority; Kathryn Grosscup, Colorado Division of Housing; and Brandy Reitter, Buena Vista Town Administrator. Greg Winkler, Department of Local Affairs; Tim Gough, Colorado Division of Housing; Karen Harkin, Colorado Housing and Finance Authority; and Elena Scott, Norris Design, also provided expertise before/during the meeting. Information and Communication: Identifying the resources and all stakeholders to engage in a county-wide dialogue on housing. Participants specified the need to involve private sector land owners and major employers and assess available resources, including access to water. Planning and Studies: To show a housing need and attract financing and developers, Grand will need a greater understanding of current housing stock, substandard housing, etc. Grand County can lead the effort in developing a request for proposals and applying for grant funds to support housing studies. Assessing the Regulatory Environment: Housing diversity is a major priority in Grand County. From Tiny Homes to mixed-use development, regulations should be updated to reflect current priorities and encourager the types of development that the Grand workforce needs. On January 31st, DCI’s VISTA team came down from their towns to attend a training and professional development session in Denver. The training featured notable speakers, such as Dr. Thomas J. “Dr. Colorado” Noel, who gave a lecture on historic site preservation, Kim Grant, who talked about how to do historic preservation from a planning perspective and how to use grants to leverage resources for projects, and Dave Skinner, who co-owns the Gore Range Artisans Group Gallery in Kremmling, who talked about how artists and art can be an economic and social anchor in the community. The training is the 3rd of 4 professional development trainings that DCI’s VISTAs participate in throughout their service year. DCI’s VISTA program offers a wide range of opportunities for VISTA members to participate in. Our VISTAs are allowed on the ground floor to do economic and community development work in small towns throughout the state of Colorado. This allows DCI to recruit and select from some of the best people in the program’s large pool of applicants. Some of the VISTAs’ past experiences with DCI include coordinating and initiating “Small Business Saturdays” in their communities around the Black Friday shopping weekend, building the capacity of Main Street programs throughout Colorado, and creating an inventory of buildings in their communities. VISTAs recruited by DCI have Bachelor’s degrees, usually in fields such as history, urban planning, sociology, and other related social sciences. The VISTAs who get selected for these opportunities truly add value to the places they serve at a fraction of the cost it would ordinarily take to hire a full-time staff person. There are 30 states that have historic tax credits, modeled on the federal program. Colorado is lucky to have one of the nation’s most robust historic tax credit programs. The Colorado Tax Credit began in 1990. It can be administered by History Colorado or by a locally designated authority (CLG). It is a 20% tax credit and follows similar guidelines as the Federal tax credit. The minimum is much lower however, with a project minimum of $5,000. To be eligible, projects must be locally designated (by a CLG) or must be on the State or National Register (or contribute to a register district). Both residential and commercial properties are eligible, as long as they are income producing (e.g. rentals). Building owners can apply on the front end or the back end of projects. Can only be filed when state general fund growth is more than 6% (this is about 2/3 of the time). Under this program, credits are straightforward, and are typically processed within 30 days. The 1990 program is still on the books, and is now the best program for small projects. In Denver, this program is known as “the Denver Program”- marketed to small commercial projects, between $5,000-$50,000. Municipalities could look into bringing this program to your community. · Separate path for commercial projects (filed with the State Office of Economic Development and History Colorado and Residential, which can go through local governments with CLG. · In 2016, $5million in tax credits will be awarded; in 2017-2019 $10 million each year will be awarded. · There is currently a waitlist for projects—if timing is a factor, this program may be difficult. · Find out early if your project is a good fit: ask local, state and federal agencies. · Reality check—decide early to “go” or “no go.” Don’t keep fighting it. · Lobby Colorado to improve the Historic Tax Credit: state like Texas have more staff and more streamlined process, and could serve as a good model for Colorado. Joe Minicozzi, Principal at Urban3, a spatial analytics and planning firm from Asheville NC, does things a little differently. Rather than trying to predict the future, or espouse a particular theory, his firm looks at the data. Using 3D visualization in ArcGIS, Urban3 takes publicly available assessor and sales tax data and creates 3D maps showing what Joe describes as the “potency” of land uses-- the highest property values and sales tax per square acre. We know intuitively that properties located in downtown as well as walkable neighborhoods contribute more to city and county taxes than properties at the outskirts of town. Add to this the cost of infrastructure associated with building further away from the heart of town. It's difficult to conceptualize this difference without a visual presentation and the Urban3, data-driven perspective is a critical solution to many of Colorado’s most pressing problems. Towns located in Colorado’s Front Range Mountains, with their proximity to booming population centers and constrained geography, face unique development challenges. These communities face a significant need for additional economic development and housing. Infrastructure costs present a significant obstacle to development, however, the need for long term investment is becoming incre asingly clear. On October 24 and 25, 2016, DCI had the opportunity to bring Joe Minicozzi, first to Nederland and then to Clear Creek County, for presentations and discussions on the cost/benefits of development in different areas of those communities. In Nederland, Joe presented to community members, town trustees, the downtown development authority board and local developer. His presentation touched on the evolution of Asheville, NC, the economic potency of downtown buildings, and the history and current challenges facing Nederland based on land use data. In the discussion afterwards, community members and local leaders talked about the need to find other towns ('grandfathers') to serve as role models for growth, the need to balance ecological concerns with economic ones, and how to approach the need for additional housing. The next day, DCI and Joe Minicozzi traveled to Georgetown, to present at the Clear Creek County Commissioners meeting. Local leaders from Idaho Springs, Georgetown and throughout the county came to see Joe and to think about future economic development in their community. Joe presented the countywide analysis done by Urban3, a thorough analysis of the taxes generated per acre throughout Clear Creek county. His analysis demonstrated that downtown Idaho Springs and downtown Georgetown are the largest tax producers per square foot for the county. Historic two story mixed use buildings, dense housing, and vibrant retail spaces make this land the most productive. As Clear Creek County looks to continue diversifying outside of the extraction economy, looking to the data will be increasingly important to determine where investment will pay the biggest dividends. DCI is thrilled to continue our work with Joe Minicozzi, and look forward to bringing him back to Colorado soon! National Research Center, Inc. (NRC) recently visited Pueblo, Colorado for the Downtown Colorado, Inc. (DCI) Vibrant Colorado Downtowns Conference. DCI is a non-profit organization that focuses on the economic revitalization of downtowns through community-wide partnerships and engagement. A three-district Creative Corridor of art galleries, public art displays and events makes Pueblo a destination for the vibrant art movement in Southeastern Colorado. See the 2016 Vibrant Colorado Downtowns Conference Photo Album. According to Livability.com, Pueblo is one of the 10 Best Cities for Historic Preservation. A community-wide initiative called Historic Pueblo is in midst of going through five Pueblo neighborhoods to identify structures as landmarks in protection of the City’s history for future development. Located on the Arkansas River, Pueblo’s Historic Riverwalk plays host to a seasonal farmer’s market, Steel City Brew Fest, Movies on the River and more throughout the year. Pueblo publicly recognizes all of its military veterans, and is home to more medal of honor recipients than any other U.S. municipality. “What is it… something in the water out there in Pueblo? All you guys turn out to be heroes!” President Eisenhower famously said. Thus the City has earned the nickname, Home of Heroes. Pueblo is home to many exciting attractions for all ages. Enjoy a fine arts performance at Sangre de Cristo Arts Center, catch a train ride with The Rides at City Park or even explore the City’s historical past at the Steelworks Museum. With the pedestrian and bicyclist paths on the Pueblo River Trail System, and the conservation and educational Nature & Raptor Center, Pueblo nurtures the spirit of Colorado outdoor exploration. The success of Pueblo’s industries such as aerospace, railway and outdoor recreation can be attributed to its commitment to a thriving economy while preserving historical and cultural values within the community. The City of Pueblo utilizes multiple channels of communication to engage with residents, including a mobile app: PuebloGo. The app is available to citizens and visitors wishing to connect with local officials, businesses and register to events. The app also provides community notifications and emergency alerts. The most recent census data places Pueblo as the seventh most populous city in Colorado. It is also the 259th largest city by population in the United States. WalkDenver recently shared our analysis of Mayor Hancock's proposed 2017 budget, specifically noting the glaring omission of funding for the infrastructure improvements along Colfax Avenue requested by the Vision Zero Coalition in partnership with the Colfax Collaborative, a joint effort of four Colfax Avenue Business Improvement Districts (BIDs) who work to make their districts clean, safe, and friendly. Colfax is currently one of the deadliest streets in Denver, with six fatalities in 2015. 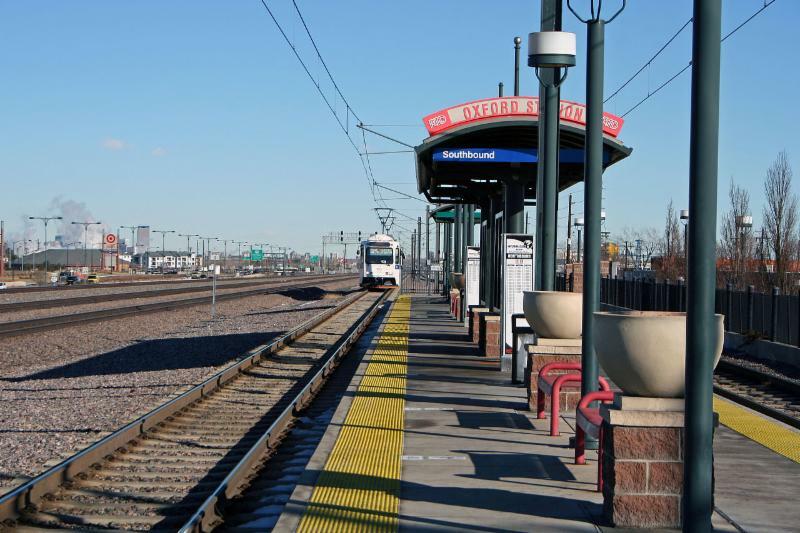 WalkDenver and the Colfax Collaborative subsequently urged Denver residents to sign a petition requesting the inclusion of $500,000 in the 2017 budget for Colfax. This funding would pay for the design and engineering of enhanced pedestrian crossings at Fairfax, Adams, and Madison Streets along East Colfax, and at intersections between Utica and Osceola Streets on West Colfax. Nearly 1,800 people signed the petition, prompting City Council to include this request along with other budget amendments formally submitted to Mayor Hancock on October 4. "Connectivity throughout our city is paramount. Colfax is such a unique corridor in Denver and in order to better function as a major artery in our city, it will require significant resources. I am happy to support this budget request and appreciate Council’s attention to this corridor and to our community’s voice. This investment will continue the design work that will help us identify the corridor’s gaps like needed sidewalk improvements, added street parking, streetscape improvements and new crosswalks and stoplights. Completing this design work is an important step to help us understand what this corridor needs to maximize its potential. Planning and prioritizing pedestrian mobility and safety improvements are key priorities of Denveright’s project goals. I look forward to planning a stronger, safer, and multi-modal Colfax corridor for all. These additional funds will be added to the transfer to the capital improvement program and will come from the General Fund fund balance." "I am grateful for Council’s support and dedication to our shared priority around Vision Zero’s mission of zero traffic fatalities. Earlier this year, I committed us to the Vision Zero effort and believe that through smart policies and strategies, including increased coordination of city department work and community engagement, we will be able to reduce fatal crashes. I support this budget request, which will allow the Department of Public Works to improve at least a half dozen more intersections than originally planned. Aside from immediate safety needs, Public Works will select intersections outside of the center core of the city and based on criteria such as proximity to schools, transit, and parks and trails. These additional funds will be added to the transfer to the capital improvement program and will come from the General Fund fund balance." City Council’s public hearing on the budget is set for October 24, and it has until November 24 to adopt or reject the mayor’s spending plan. We are grateful to Mayor Hancock for adding these items to the 2017 budget, and to everyone who spoke up in support of making Colfax a safer and more vibrant street for people walking, biking, and taking transit. The funding marks an important step forward for Vision Zero, and continues the momentum of WalkDenver's "People on Colfax" initiative. We believe that Colfax can and should be Denver's premier Main Street, and over the past few years have worked with community members to document the factors that make Colfax unsafe and unpleasant for pedestrians (see our reports for both West and East Colfax), demonstrate design solutions that would make Colfax more people friendly, and celebrate Colfax's unique character with art. You can help us continue this important work by contributing to WalkDenver today! Click here to support WalkDenver and help make Denver the most walkable city in the nation! One of the most difficult challenges for rural Colorado communities, one that Downtown Colorado, Inc. (DCI) sees again and again, is the small size of municipal staff. In rural communities throughout the state, professional staff work tirelessly to help their communities. With limited time and a multitude of projects, it can be impossible for staff to tackle new projects or expand their efforts. With this challenge in mind, and with the experience of having hosted a VISTA for the last three years, DCI set out to establish its own VISTA team for rural Colorado. This year, DCI is launching Downtown Capacity Builders, a team of VISTAs placed in rural communities, dedicated to downtown revitalization efforts. Host communities throughout Central and Southern Colorado are, as we speak, working hard to prepare for the VISTAs, who will begin their work in April, 2016. AmeriCorps VISTA, envisioned as the domestic Peace Corps, began in 1965. VISTAs, or Volunteers in Service to America, dedicate one year to working full time for a non-profit or small public agency to build capacity of that organization, so that it can better meet community needs. VISTAs are typically young and college educated, and through their service gain valuable career skills in the nonprofit and public sector. They are paid a living stipend throughout their time. As a former VISTA, I can attest to the powerful community of VISTAs and VISTA Supervisors, and the incredible opportunity afforded by such an experience. DCI could not be more proud to be launching this time. Hopefully the enthusiasm and time of a full time VISTA our partner communities will see their time management worries decrease and their projects grow and expand. For more information on the Community Capacity Building program and how it can help your community, please contact Jamie Shapiro by email at vista@downtowncoloradoinc.org or call DCI at 303-282-0625 with any questions. Jamie Shapiro previously served as DCI’s AmeriCorps VISTA. He is currently pursuing a masters in Historic Preservation from the University of Colorado Denver.